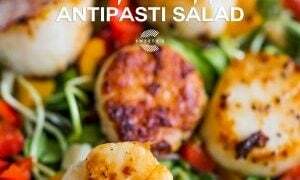 Gourmet scallop and pepper antipasti salad is effortlessly elegant – a five star dish anyone can make in under 15 minutes! When I visit my parents at their home in suburban Baltimore, I love indulging in the wide variety of fresh seafood that is all over. 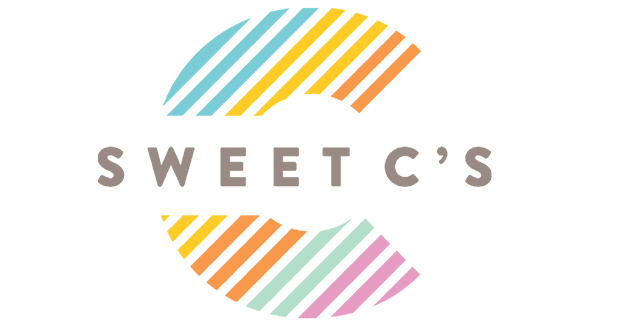 In Denver we get some pretty good seafood (it’s not ALL rocky mountain oysters out here…) but obviously, for fresh, delicious seafood it sort of helps to live near a major body of water. It’s not uncommon for me to want to eat seafood for every meal when back east – and I’m always excited at the wide variety of fish I can cook with when there. 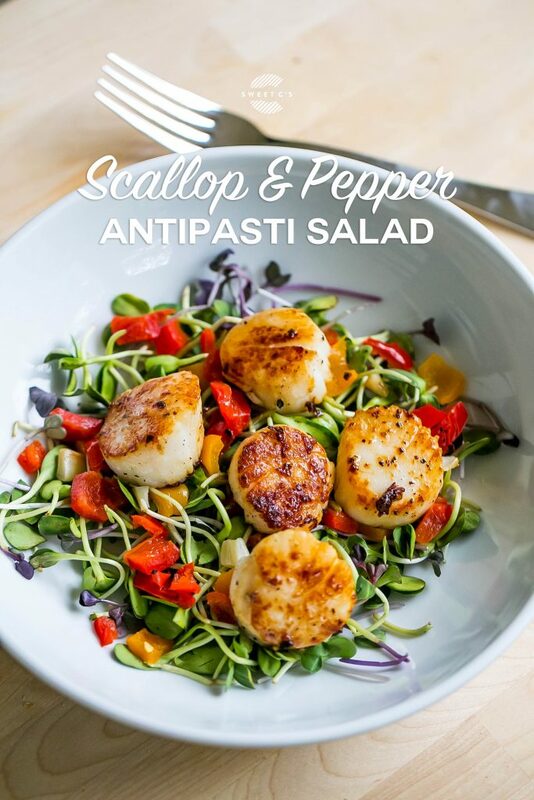 This last summer when we headed to visit my parents, I found some amazingly fresh and large bay scallops that I knew I needed to make something special with. 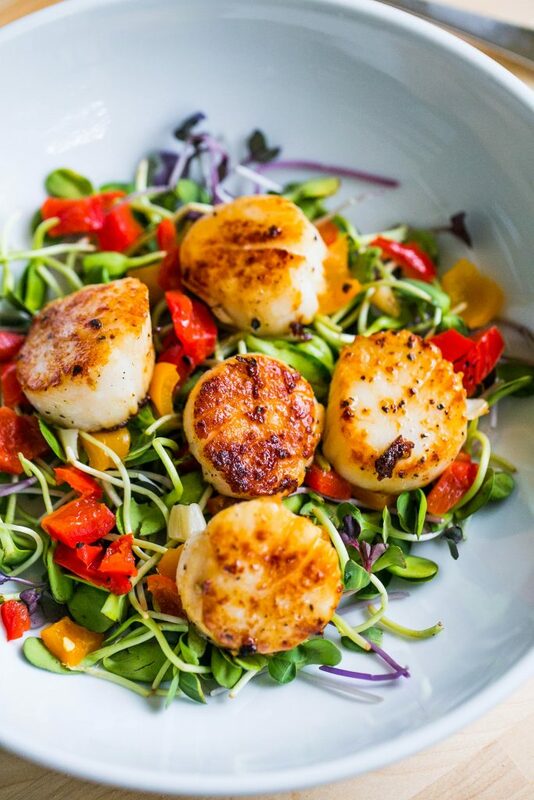 Scallops are one of my favorite things ever – they are rich and buttery, a little sweet, and salty – they are simply perfect! 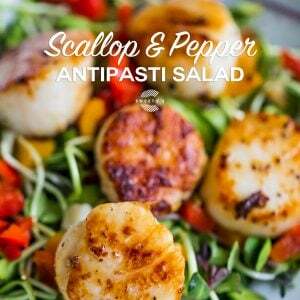 But making meals with scallops has always been a bit tricky for me – I love them so much, I dont really want anything interfering with them. 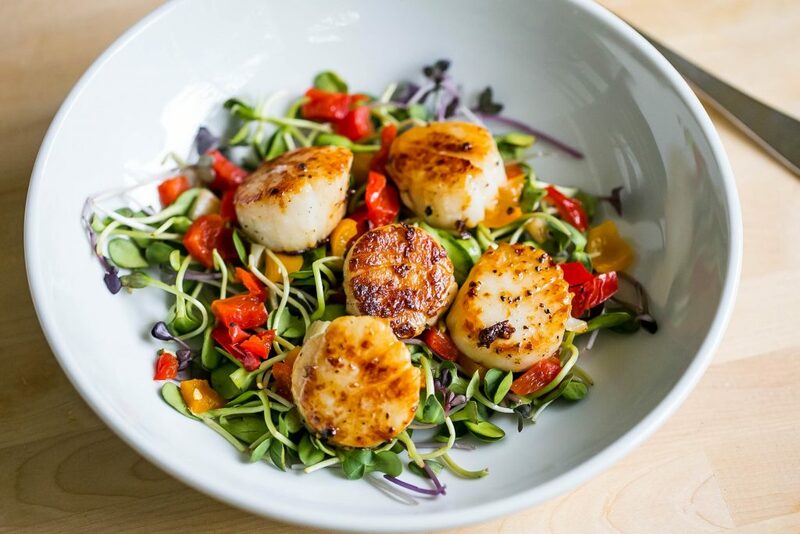 Scallops have a subtle and delicate flavor, so it’s important to not overpower them with tons of other stuff. This salad is simple and delicious with pickled piquillo peppers and some peppery sunflower sprouts, as well roasted garlic soaked in olive oil. It’s light, delicious, warm, and colorful- perfect for an impressive meal that is actually super easy to make fast. This recipe calls for both piquillo peppers and roasted garlic in olive oil. I get these at my grocery store (Kroger, Safeway/Albertsons, Whole Foods have all had them) in the antipasti/deli section in the you-scoop-your-own cups that are usually near the gourmet salad bar area. If your store doesn’t have an antipasti area, you can usually find similar items in the Italian food area. Also, I am using sunflower sprouts here for their peppery flavor – I love how it pairs with seafood – but you could use any type of greens you prefer! I love this salad so much – I am definitely saving it for Lent when I need additional meal ideas! 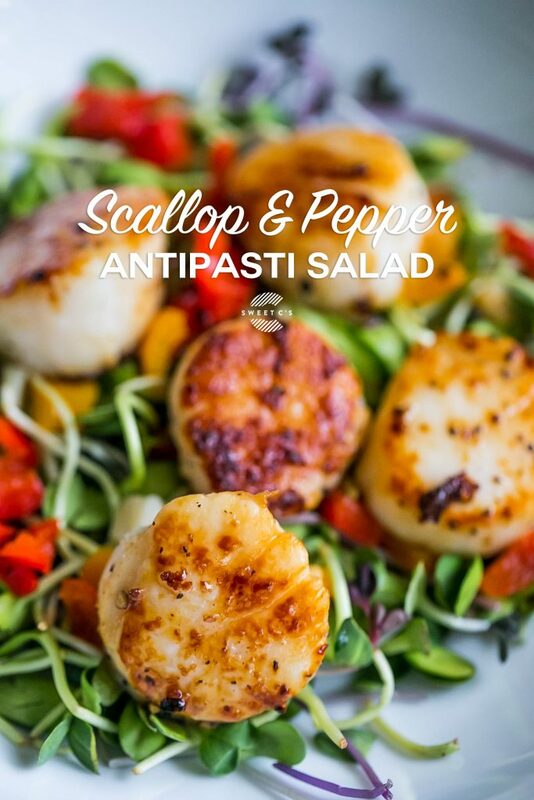 Gourmet scallop and pepper antipasti salad is effortlessly elegant - a five star dish anyone can make in under 15 minutes! In a large, heavy pan on high heat, melt ghee. Add to pan and heat on high until well caramelized on each side, about 4 minutes a side. Add sunflower sprouts to three different plates or bowls. Add diced peppers and garlic to each bowl, and drizzle with the oil garlic was sitting in. 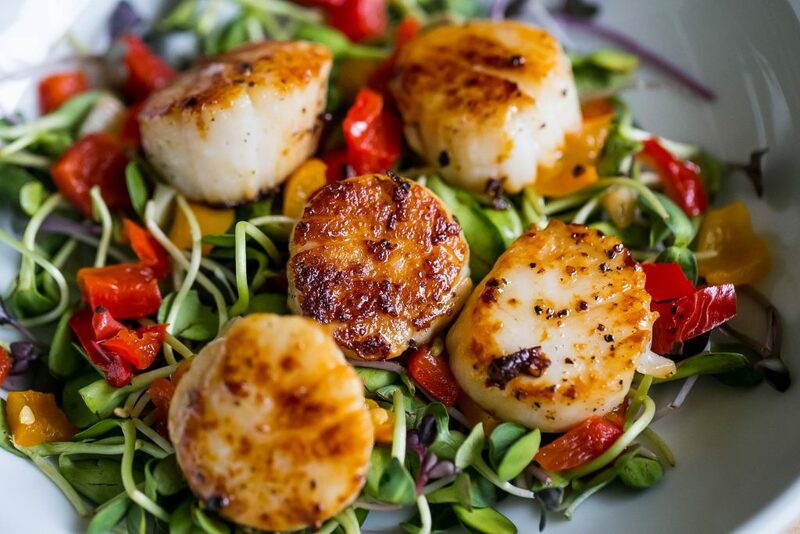 When scallops are caramelized on each side, remove and immediately plate on top of greens.